I took a long hiatus from reviewing, but it was not at all for lack of good music coming out… When I started reviewing on JMR I was a single college student, and now I’m married with a 2 year old. I generally listen to Uncle Moishy all day, but my very opinionated (in the best way) daughter has started requesting my music, so I am cautiously optimistic that I am going to be able to add some variety to what I regularly listen to , in the form of all the great stuff that has come out recently. Baruch Levine and Simcha Leiner both have brand new albums on the market right now, and they are already shaping out to be big hits and for good reason. But that doesn’t mean that the album they collaborated on this summer should be lost amongst all the other big hits. For any fan of Baruch Levine and/or Simcha Leiner, this is a must have. And virtually all fans of good Jewish music fall under that category. These two singers are seemingly very different. Simcha Leiner has a big powerful voice and an unbelievable range. Baruch Levine sings at a higher octave and has a gentle feel to all his songs. But they blend seamlessly. I guess good singing is good singing, right? And they both are so full of heart and passion. They’re so genuine. It works really well. After each song, I felt myself saying, “Wow!”. You already knew that Yochi Briskman was a masterful arranger, and this album confirms it once again. Everything on the album is done intelligently– the song selection, when exactly each singer comes in, how much to use choirs (relatively little). Music traditionalists will appreciate that there is no techno or rock on this CD whatsoever. For many of you, most of these songs won’t be entirely new. But these are new versions and arrangements, and even a Baruch Levine song is totally different when he is joined by Simcha Leiner, as is a Simcha Leiner song when he is joined by Baruch Levine. The new versions are more than worth a listen. For those of you not familiar, let me explain what exactly this album is. Its a collection of 25 tracks, almost all of which were big hits in the Jewish music world in the last few years. The tracks range from 1:02 to 3:01, so all of them are shorter than any song on a typical Jewish album (but you get 25 of them!) . Every five songs or so blends into the next to create a continuous melody, with the last song in every melody being more up tempo and like a miniature finale. The entire album has a more laid back feel– hence the name. Yes its relaxing, but its not all very soft and very calm songs like I frankly expected. An excellent choice to start off the album, this song rightly was chosen to be the namesake of Baruch Levine’s fourth album (Modim) . Right away we see how majestically these two very different singers blend together . This song starts off with an adult choir and leads into a children’s choir. 1:45 Simcha Leiner, one of my favorite notes from the entire album. Just wow. Made popular in Yaakov Shwekey’s hit album, Kolot, this sped up version still (somewhat) keeps the Sephardi pronunciation from Kolot. This Eli Beer song is much less Carlebach, but equally heartfelt. The choir is used perfectly here and there are some great harmonies, especially int he last 45 seconds of the song. One of my favorites. I think its safe to assume we all know this song, right? Most of us were introduced to Simcha Leiner through Kol Berama, which still makes me cry every time I hear it. This is one of my favorite songs of all time. I wish this version were a bit longer (1:51). I could’ve used 5… or even 10… minutes of it. It is also sped up, as its sort of the “finale” of this group of songs, and I wish it started out a little slower like the original version. Kesser starts out a new track with a slightly Hasidish feel, which means of course it is full of heart. 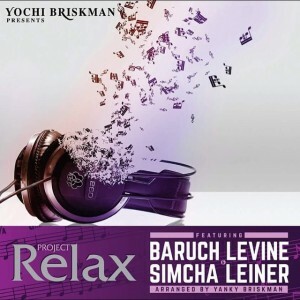 It is incredible how in this track , as well as many others, Simcha Leiner and Baruch Levine manage to keep the feel calm and relaxed while injecting so much power. I did not know this song before, but I am now browsing the selection of Hasidish choir CDs online… I love it. Speaking of power… Melech Malchei starts out soft, and builds up to be incredibly powerful. Again, the last 30 seconds, just wow. One of my favorite Baruch Levine songs of all time…perhaps my favorite. If you haven’t heard it, Bitchu mixes Hebrew with a little bit of English to convey the message of trusting in Hashem. This song really makes me feel like a child with Hashem holding my hand. I know that’s incredibly cheesy, but its the only way to get across how touching this song is to me. An exceptionally moving song you might have heard by Yedidim Choir (if you haven’t , there is a video of the entire song, and it’s a must see/ listen), Simcha Leiner and Baruch Levine do this track justice. The Yiddish mixed in with the Hebrew, all begging Hashem to give us strength, makes it even more emotional. Definitely one of my favorites. I actually first heard this tune on Baruch Levine’s “Touched By A Niggun”, in a really moving story about an (spoiler alert?) Arab moved by Lcho Dodi who finds out he is a Jew and descendent of Rabbi Shlomo Alkabetz. But anyway, this is a nice smooth melody from Baruch Levine himself. Pischi Li, one of Simcha Leiner’s songs from his first album, starts out the third group of songs. It was one of the best songs on Simcha Leiner’s hit album, and again, this version is worth a listen. If you haven’t all heard the original version of this song right now, please immediately go buy Rabbi Shlomo Yehuda Nechnitz’s Shir. Not to downplay this version at all, because it also gets a big “Wow” from me. Incredibly moving composition that literally brings tears to my eyes (again? )… One of my favorites of all time . Another song I wish were 5 or 10 minutes long. I can’t say enough about the song choice on this album. Besheim Hashem was probably my favorite song on Benny Friedman’s Yesh Tivkah. This song shows off how dynamic these two singers really are. Who would have thought that Simcha Leiner, with his power , could sound so gentle and calm when he sings the “lie lie lie …” , and Baruch Levine rises to match his power. Yesimcho deservedly gained incredible popularity via Yaakov Shwekey’s Cry No More. Yes, the song was written for Yaakov Shwekey, and he did it brilliantly, but when you listen to it here it seems it was written for Baruch Levine and Simcha Leiner. Originally sung by super talented Israeli child star Uziah Tzadok and on the aforementioned Shir in honor of the three kedoshim Gilad, Naftali, and Eyal, this song gains a whole new dynamic when put in new hands. With Baruch Levine’s Umocho we start out the fourth group of songs on the album. It sounds a bit stripped down from the original version, at least for the first half when it really picks up tempo. A great song before, and still a great song. A more upbeat song but still true to the feel of the CD, the choir is featured prominently in this song. Another Carlebach-like song… this time from Yehuda Green… re-imaginged Yochi Briskman style. I don’t know what it is about Yiddish. I don’t understand it most of the time. But it adds an extra layer, when done the right way (as it is here, and makes the song seem so much more genuine. Well done by Yehuda Green and well done again by the Briskman-Levine-Leiner trio. I honestly don’t know where this song originated. I first heard it on Beri Weber’s (name of album), which I reviewed, and I immediately loved it and still listen to it very frequently. I then heard it on the radio sung by someone else. I eventually was told that it was as “yeshiva” song— how was I supposed to know that? So I still am not sure of the origin of this song, but I love it anyway. Its perfectly suited for a duet, and as we have already established, so are the voices of these two singers. Another gorgeous, somewhat haunting track, though the tempo is picked up quite a bit, so its less haunting. A sped up version of Yaakov Shwekey’s song from Kolot, this one also uses Sephardi pronunciations. I love this arrangement and think I actually prefer the sped up version. A gentle, soothing, and yes, relaxing song to start out the last group on the album. This song was also on Simcha Leiner’s debut album and is one of the most moving on the album (which is really saying something). Of all the lyrics you can find in Jewish music, these are amongst the most powerful in my opinion. This is one of the songs on the album I want to play over and over and moves me every time. Another beautiful composition from Shir, and though I love the original version, it is fascinating to see what different hands can do with the same composition. Again, I love both versions. Birchas Habonim, from Ohad’s III, is heard at Jewish weddings everywhere, and rightfully so. Simcha Leiner and Baruch Levine do it justice, and their voices along with the words and melody get another “wow”. Well, this song isn’t really relaxing, its more fun and upbeat, but it works well as we end with a bang… so when is Project Relax 4 coming out?